Mr Timms said he was running slightly late when he arrived at the Beckton Globe community centre for his regular Friday surgery. Choudhry, who was dressed in black, had made an appointment for 2.45pm, specifically to see him rather than an assistant, and was the second person he saw that day, just after 3pm. The MP said: "She didn't go and sit down as she continued to come towards me where I was standing to greet her at that point. I thought she must have been coming to shake my hand. She made as if she was coming to do that. She looked friendly. She was smiling, if I remember rightly. I was a little puzzled because a Muslim woman dressed in that way wouldn't normally be willing to shake a man's hand, still less to take the initiative to do so, but that is what she was doing." A male non-family member, and a kuffr at that - and she wants to clasp his hand? Mr Timms is attuned to his constituents. "She lunged at me with her right hand." Mr Timms pointed at his stomach to show the jury where the knife had gone in. The Old Bailey heard how the young Muslim woman had plotted for weeks to kill her local MP, buying two knives in case one 'broke' when she enacted her 'punishment' for him voting in Parliament to invade Iraq in March 2003. After the attack, she coolly told police: "I just pushed it in like how it is if you punch someone. I was trying to kill him because he wanted to invade Iraq. I was not going to stop (stabbing him) until someone made me. I wanted to kill him. I was hoping to get revenge for the people in Iraq." I was trying to kill him because he wanted to invade Iraq. I was not going to stop (stabbing him) until someone made me. I wanted to kill him. I was hoping to get revenge for the people in Iraq. Which is an odd thing for her to say. Leftists, liberals and assorted conservatives are always at pains to say how British born muslims are just as British as the rest of us. But real British citizens dont seem to have got fussed enough about Iraq to kill an MP. What evidence they base this myth on is not generally reported. "Jeremy Dein QC, defending, said she did not recognise the jurisdiction of the court..."
Funny, I'm sure we were told at the time that she was just some mentally ill woman. 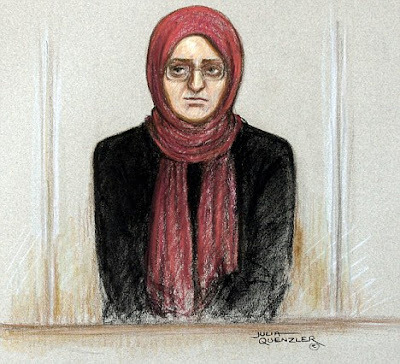 Now we belatedly learn that she was in fact a radical Muslim attempting the political killing of an MP. Justifiable homicide - good for ragheads, not so good for Timmsy. Regime(esp the last one) policies resulted in the deaths of many thousands of Muslims abroad; domestically cities and towns have been swamped by them. In which case we would have had the usual breast-beating cant; the weeping, the wailing, the gnashing of teeth; whilst they didn't really give a damn. But this was right up close and personal. Timms looks like one Frankenstein did earlier at the best of times - having said that he looked distinctly queasy on the box the other night. What made me queasy was the BBC hand-wringing hypocrisy about attacks on "elected representatives"
"British democracy: no better than Uzbekistan's"
Not recognising the legitimacy of the court should automatically add an extra ten years onto the tarrif. Preferably with the judge shouting "Recognise me now, beee-atch?" as the prisoner is taken down. Not recognising the legitimacy of the court should automatically add an extra ten years onto the tarrif." Well the British Ancien Regime doesn't have much legitimacy - and every day a little more seeps away. Whats funny as well is that if she was an IRA woman no one would be calling her just nuts or somehow jsut sad but would recongnise the deep hatred behind the act and the fact that she swims in a fair sized pool of simailar fish. "Ihre Papiere bitte, Mein Herr"